Ok, Kathy threw a monkey wrench in today challenge! The topic is “Vegetable”, ugh! Don’t get me wrong I love to eat vegetable but how the heck can I blog about something that includes motorcycle and vegetable in the same topic? Originally, I already had a post ready to go in the morning. I was trying to get ahead and couldn’t think of anything inspiring to write about. So I was going to cheat and post a link of another blogger’s post about motorcycle and vegetable. He is a sushi chef with a passion for motorcycle and culinary art. So, he made sculpture of motorcycle using vegetables. However, this morning, I had “aha” moment and knew what I should have written about. As you know, I have a geeky obsession with roadside oddities and attractions. During my trip, I have posted many pictures of places I have seen using an app/website called www.roadsideamerica.com. I have to thank my sister-in-law, Linda for the introduction to this app. Just like her brother, Russ, she has affinity to anything weird and quirky. So when I made a stop to her place in Ohio on my trip, we spent the day sightseeing using the RoadsideAmerica app. 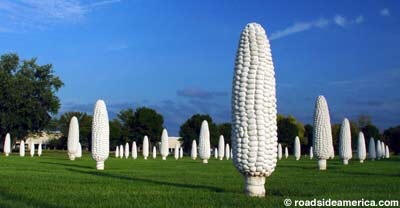 One of the places we stopped at is the Field of Giant Corn Cobs in Dublin, OH. The park host 109 life-sized (8 feet tall) concrete ears of corn. The place is a tribute to Sam Frantz, an inventor of several hybrid corn species. Just like a monkey wrench, you just never know where you might come across a vegetable while out riding on a motorcycle. You are correct! It was just a writer block with trying to be creative with an unusal topic. I never knew about the corn park! Yeah I kind of figured but it’s more fun and challenging trying to.